At a recent conference about children’s thinking the presenter, the acclaimed author Marion Dowling, made a comment about why it is so important that we should understand children’s thinking processes and how we can then use this in our work. As she stated – “we can’t compel children to engage”. I’m sure every practitioner can empathise with this, having sat in front of a group of children with a book and knowing that not every child is listening! Marion then went on to describe a situation she had observed in a reception class, who had been learning about Goldilocks and the three bears. When it was time to review their learning the teacher didn’t fire questions at the children but chose to dress up as ‘Mrs Locks’ who had lost her daughter ‘Goldie’. 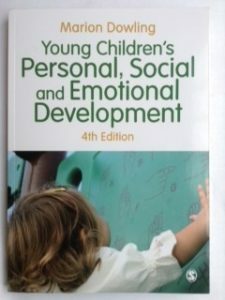 This is the second edition of a book first published in 2000. What a lot has happened since then, with the Laming report, Every Child Matters and the EYFS. Despite this I think Marion Dowling has written an incredibly relevant book with the bonus of being in an easy to read format. In this book she deals in detail with topics you would expect to find, such as confident children, becoming independent and emotional well being, as well as a refreshingly large chapter on outdoors and how this promotes all round personal, social and emotional development. All the chapters are well referenced and grounded in real experience of nurseries and early years settings. Each chapter concludes with a short summary, practical suggestions and professional questions. It is the latter which I found the most thought provoking. Some typical examples are: what aspects of my behaviour offer a positive role model for young children? How do I help all my children to adopt mastery patterns of behaviour? And what do I do to take care of my own spiritual life? This last question comes from Chapter 7, entitled Young Children’s Spirituality. I was initially concerned when I saw this chapter that it would be about the deep and troubled waters of religion, but in fact it investigates “appreciating the journey through life in the deepest sense, particularly special moments and recognising our own inner resources to help us cope with the journey”. Something we could probably all do with from time to time! She explores feelings of transcendence; search for meaning and purpose; creativity and a sense of awe, wonder and mystery, with perception and conciseness. The concluding chapter, however, is the one which raises this book from the ordinary to the extraordinary. Entitled Some Important Ingredients, the first half is about “powerful ways of supporting children’s personal development through book, storytelling and fantasy play”. The second half of this chapter is simply entitled Yourselves. Most literature and research agrees that the practitioner is the most valuable resource, but how often are the qualities of this ‘resource’ discussed and detailed? Marion Dowling has been able to do this sensitively and realistically, discussing qualities such as flexibility, empathy and optimism. Anyone who has worked in early years settings will recognise the situations she discusses and what is required of the practitioner in these circumstances. For example, under ’emotional maturity’ she raises the issue of family break-up – “Natural responses are to feel disturbed, upset, angry and frustrated. It is not easy to handle these emotions but practitioners need to learn the importance of remaining outwardly calm and in control, being able to cope with complexity”. Good advice indeed! In this book Marion Dowling has captured the essence of what a good quality childcare provider should be doing to foster a child’s personal, social and emotional development. It is a well researched book which covers theory and then puts it into practice. The professional questions are thought provoking and captures the current move towards professionalism in early years. However, for me the most outstanding parts of this book are the chapters on spirituality and the qualities of a high quality practitioner, which makes this book essential reading for practitioners and those employing them.